Wanna make a Tibetan style necklace? 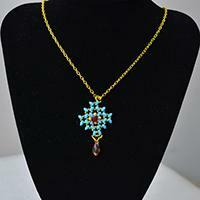 Next I will show you a Tibetan style beads and chain necklace, hope you will like it and have a nice try! 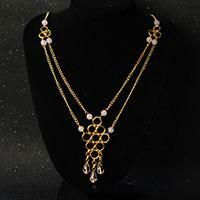 Bead and chain necklaces can be very simple as well as beautiful. 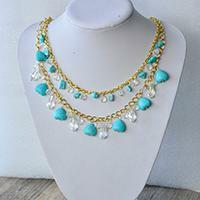 And today, we’d like to share you a chic and easy to make bead and chain collar necklace, hope you like it. 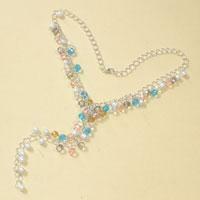 Are you searching for chain necklace with beads? 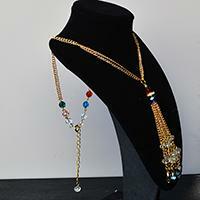 Look here, this tutorial will show you a chain tassel necklace with glass beads. Hope you will like it. 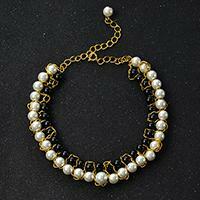 This is an easy tutorial on making a chic black and white choker necklace with beads and golden chain. 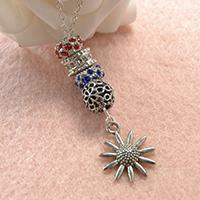 If you are searching for necklace making ideas, never miss this one. 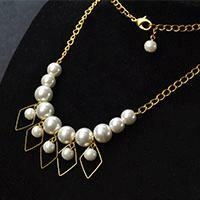 Looking for easy necklace designs? This Pandahall tutorial will show you an easy to make purple flower pendant necklace with antique bronze chain. 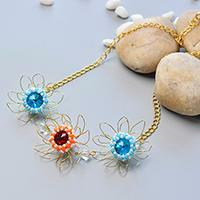 This Pandahall original DIY project is about a bead and wire flower chain necklace. 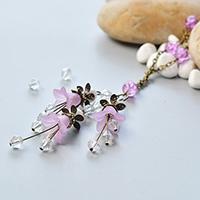 Hope you like this flower chain necklace. Wanna learn how to make simple necklace? If yes, you won’t miss today’s Pandahall tutorial on how to make delicate pendant necklace decorated with pearl and rhinestone cabochon! 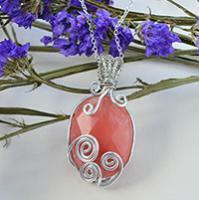 Love aluminum wire jewelry? 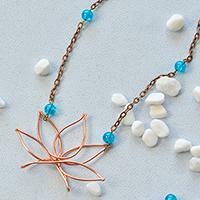 If yes, today’s Pandahall tutorial on how to make aluminum wire wrapped lotus chain necklace for women is a wonderful choice for you. 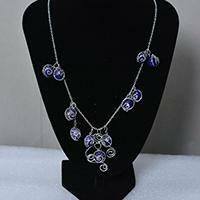 Are you planning to make beads and chain necklace for yourself? Then today’s Pandahall tutorial on how to make chain necklace with glass beads and heart turquoise beads may be a great choice for you. 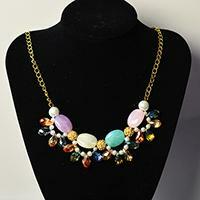 Wanna Try necklace for girls? If yes, toady’s Pandahall tutorial on how to make wire wrap chain necklace with drop jade bead pendant really worthy of your attention! 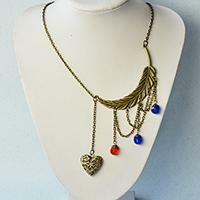 Love chain necklace? If yes, today’s Pandahall tutorial on how to make cute chain necklace with glass beads tiger pendant really worthy your attention! Do you like Pandora beaded necklace? 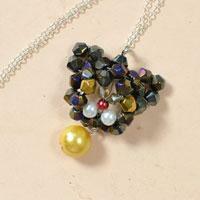 In this easy Pandahall tutorial, I'll share a handmade Pandora beaded necklace with you. Hope you like it. Wanna make pendant necklace? 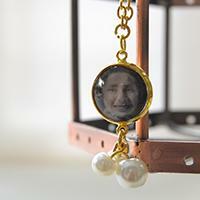 If yes, you can’t miss today’s Pandahall tutorial on how to make easy chain necklace with sticker and pearl beads pendant! Wanna make chain necklace yourself? 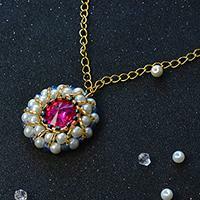 If yes, I believe you could get some inspirations from today’s Pandahall tutorial on how to make 2-hole seed beads chain pendant necklace for women. If you are searching for Valentine’s Day necklaces, I think today’s Pandahall tutorial on how to make girls’ chain necklaces with glass beads is a great choice for you!